Yellow gold has for many years been the traditional metal colour for an engagement ring, although in the last ten years or so it has not been as popular as white gold. As with all fashions, this is slowly changing and once again we are seeing a resurgence in the use of yellow gold in engagement and wedding rings. It is often teamed with white gold, so the band of the ring is made in yellow gold, with a white gold setting. All yellow gold engagement rings are not requested as often as two tone yellow and white gold rings. This is because diamonds are prisms that reflect the colours that surround them, so yellow gold settings can make a white diamond appear to be yellowish. In its pure form, gold is too soft for use in making engagement rings, especially when we consider the hardness of diamonds. Some cultures do use 22ct. 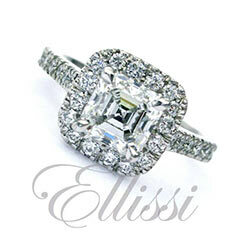 gold in jewellery but in Australia engagement rings are usually made in 18ct. gold. Eighteen carat yellow gold is an alloy that consists of pure gold (75%), with the remaining 25% a mixture of copper and zinc. It is stamped 750, as it is 750 parts per 1,000 parts pure gold. Is Nine Carat Yellow Gold Stronger than Eighteen Carat Yellow Gold? Due to their weight, male wedding rings are sometimes made in 9ct. gold to reduce the cost of the ring. Nine carat yellow gold is an alloy of pure gold (37.5%), with the remaining 62.5% a mixture of copper and zinc. Rings in 9ct. yellow gold are harder than 18ct. yellow gold, but less dense and are lighter. Interestingly, 9ct. white gold is actually softer than 18ct. 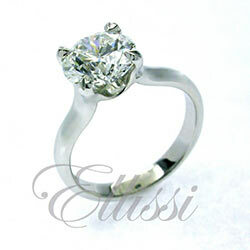 white gold, due to it’s high palladium content, and it can tarnish if it is left in the box and not worn often. Click on the following links for more information about other precious metals used in the manufacture of engagement rings: white gold, rose gold and platinum. Of course, as custom ring makers, we can make your engagement ring in any metal colour, or combination of colours that you choose.